Samanayrs • View topic - Naming HELPPP! Ideas for this little one please need everyones HELP!! @. @, Lost on names. Was based off of the Pink Poodle Moth I believe. Last edited by Codress on Tue Aug 11, 2015 3:37 pm, edited 2 times in total. Post subject: Re: Naming HELPPP! 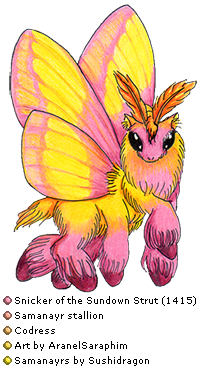 I think the species he's based on is more commonly called a Rosy Maple Moth, so maybe Rose of the Twirling Sundown? Or Warmth of the Rosy Maple? ^^ Good luck finding a fitting name for him! Wow has 40 something looks and only 3 people voted....are the names that bad? Lol come on Sam ppl give me your imput!! Plz. Wake of the Rosy Horizon? That gives me ideas!! Ty for your imput. Anyone else plz!!!!! Lol ty ty ahead of time.